Plants in the family Cactaceae have special adaptations that allow them to survive in dry climates. Cacti have many of the same parts as ordinary plants but in a form better suited for growing in dry regions. These adaptations help cacti store water more efficiently by decreasing water loss. Although cacti are mainly found in warm, dry areas, a number of species are adapted to colder climates. The cactus’ upright trunk makes up its stem. Cactus stems are similar to other woody plants in that they store and transport nutrients and water while physically supporting the plant’s various structures. The stem’s inner tissue contains the cortex, a thick, succulent material that stores and transports nutrients and water throughout the plant. The stem supports several features including the arms, tubercles and arioles. 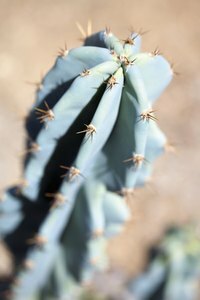 The tubercles are rows of raised tissue that support the areoles allowing the cactus to expand and contract as it gains and loses water. Cacti reproduce using flowers pollinated by birds, insects and bats. Cactus flowers have an unusual structure consisting of a hollow tube with petals flaring outward from the end. The flower's stamens grow from the inside of the tube with the carpal covering the lower interior. The tube’s outside is covered with shoot tissue that produces actual leaves. These flowers produce seeds and fruit that spread the cactus to other areas. Cactus spines are an adaptation designed to protect the cactus, regulate its temperature and capture water. Cactus spines grow from the center and edges of the rounded areoles. The central spines discourage foraging animals and capture rainwater, directing it downwards towards the roots. The thin, white, radial spines on the outside of the areoles reflect and absorb sunlight. Cactus species with few or no spines often produce toxic chemicals as a defense mechanism. Cactus plants have a broad, shallow root system designed for efficient water collection. These root systems are often very close to the surface to catch small amounts of rainfall that does not penetrate deeper layers of soil. The broad root system protects them from wind damage in dry, loose soils. Large species with a tall stem often produce a central taproot further anchoring the cactus, while accessing water stored deep in the soil.